A Carscoops subscriber snagged this picture of what's asserted to be Fiat's coming midsize pickup with which it is going to compete against the Toyota Hi-Lux, Ford Ranger, Nissan Navara and VW Amarok. 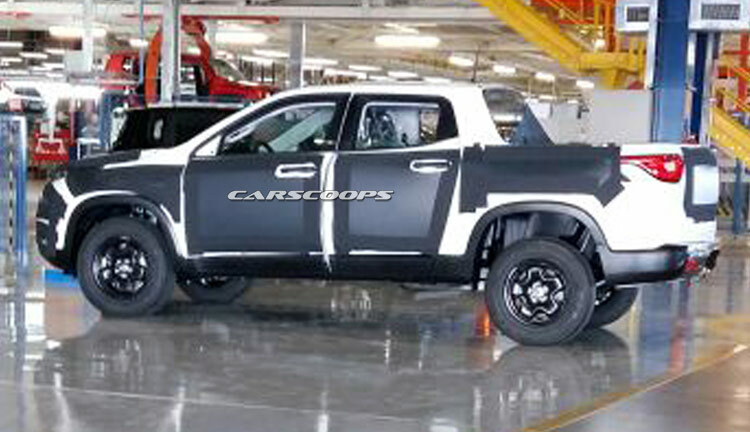 When our own spies caught Fiat screening a greatly disguised image of the as-of-yet-unnamed truck before in 2013, there was not much we could inform about the layout as it was concealed behind plastic body panels. This one, on the flip side, is much more showing - if, needless to say, it's Fiat's new truck in double-cab form, as we have yet to verify this. Fiat gave us a futuristic perspective a four door pickup cross over-mix at this past year's Sao Paulo Motor Show in Brazil with the FCC4 Idea, although the version seen here is way, a lot more more traditional, in the event you actually try, you may discover quite obscure similarities in a few aspects like abstract of the taillights. We are going to upgrade just as we find out more. As a result of R. for the scoop!